When we think of "green vegetables", the first name that pops into our head is Spinach or Palak. This leafy vegetable is super nutritious and delicious at the same time and is widely utilized throughout India and the world. You can find various varieties of spinach in the market but the most common one is the large, smooth flat leafed spinach extremely common in Indian households. I have to admit, I am a spinach fanatic. When I was a kid, I watched a lot of Popeye and looking at him gain his biceps and defeating bad guys after eating cans of spinach, always made me wonder if that would happen to me as well. Newsflash, it didn’t, but I still ate it because it tasted so good. Then I grew up and realized that even if I didn’t gain the muscles, I got a lot of nutrients, vitamins and antioxidants from it that made me feel better than having the muscles. 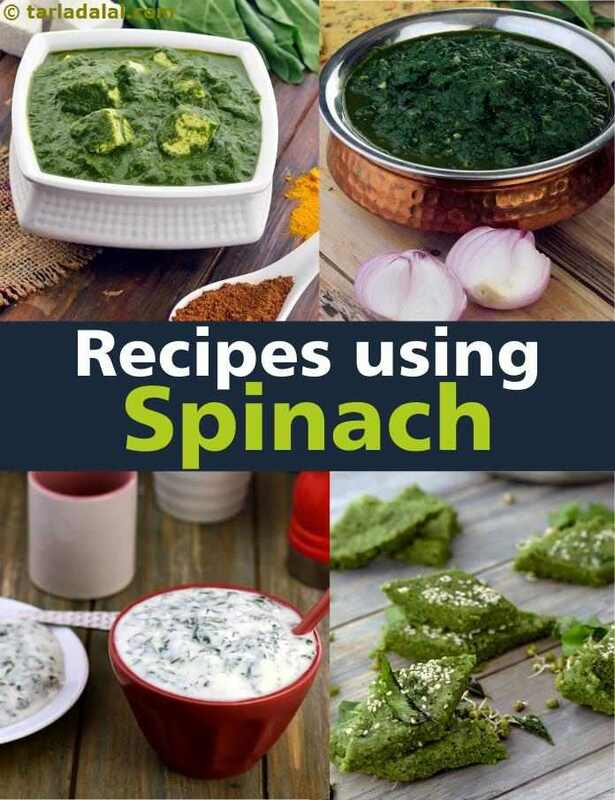 There are so many different ways to prepare spinach whether is it boiled, blanched, pureed or raw, but the beauty of it is its versatility and the ability to taste good with anything. May it be sabzis or dals or even different parathas, you can add spinach to anything! Starting with the classic Palak paneer (honestly, who hasn’t had palak paneer?) to the Punjabi delicacy Sarson ka Saag, it is incorporated in each and every cuisine throughout the country. Bengalis like to us it in sabzis like Boriya Diya Palang Saag which has moong dal dumplings cooked in a spinach gravy or Palong Shaakwhich is a simple stir fried spinach flavored with garlic and onion. Spinach puree can also be added to different hot snacks to give it a vibrant green color like done in the South Indian Palak Rava Idli and Oats Palak and Sprouts Mini Uttapa, or Dal Pandoli, a Gujarati snack made with chola dal and steamed. A lot of kids do not like spinach but they most definitely will like Saagwala Cheese Kofta, where a blend of cheese and potatoes is used to make the koftas and what kid doesn’t like cheese in their food? or take it one step further and make the koftas using spinach itself to give it a new twist like in Palak Pakoda Kadhi, which is absolutely delicious. Who knew spinach would taste so delectable when had as a soup? I like to play around with the combination of spinach and various other ingredients and try and test them out to adapt to new flavors. A few of my favorites are Spinach, Lettuce and Spring Onion Soup, where lettuce is imparted a beautiful flavor with spinach and nutmeg; Quick Vegetable Soup which is a creamy, cheesy soup with carrots and other vegetables or the classic Cream of spinach soup. We already know that spinach is high in all sorts of nutrients (if you don’t then you should read this 10 reasons to eat more spinach) then you definitely know that it should be included in our daily diet. If you can do it in the later stage of the day, there is always breakfast. You can make blend it up with some mangoes and bananas to make Mango, Banana and Spinach Smoothie Bowl or by spicing up Pulse Appe with it. Our staple diet includes rotis and plain rotis become too boring to have day in and day out. By adding spinach to them, like in these Whole Wheat Spinach Rotis or Spinach Puris, you add a healthy and earthy element to them. You would never have thought of this combination! but noodles tossed with spinach, cheese sauce and colourful vegetables results in an absolutely delightful treat.